← Tropical cyclone + cold front = sunny skies? What?! 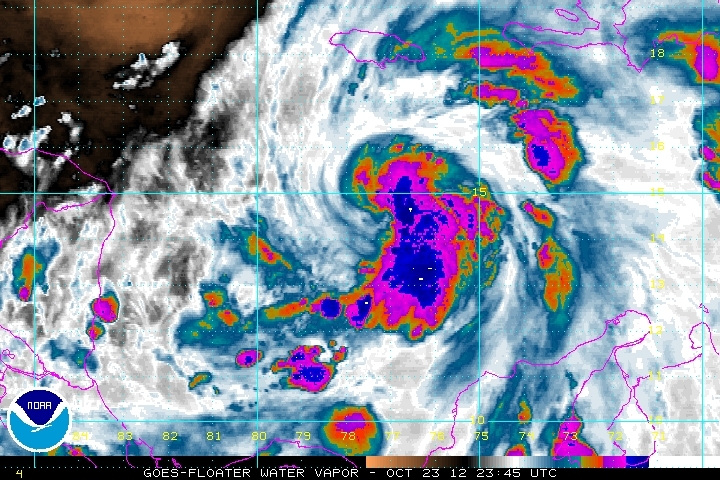 Tropical Storm Sandy has it’s sights on the northern Caribbean. What are the impacts on Florida? The tropics really heated up yesterday with the formation of two tropical depressions and since then TD 18 has become tropical storm Sandy. Sandy is a moderate tropical storm with winds of 50 mph and a minimum central pressure of 993 millibars as of the 8pm advisory and some recent higher winds have been found by recon. The hurricane hunters are currently inside of Sandy getting a better idea of exactly what kind of winds Sandy contains and how she is organized. In this discussion, I will largely look at the upcoming three days instead of the more complex long term forecast, which we will talk about in the week to come. Here is a recent water vapor image of Sandy. Notice the dry air to the NW over the Gulf of Mexico. That dry air aloft should not affect Sandy, but it will keep the local weather across most of Florida quiet. Sandy will help bring in drier air from the north on her west side over the next week. In the near term, Sandy is expected to intensify rather quickly over the next 24 hours. In fact, there is a 70% chance of strong intensification (defined as an increase of 30 mph winds) before hitting Jamaica and Cuba. Why is it that the storms that have formed since the beginning of the season have failed to rapidly intensify, but the chances are so good for this one to intensify? For starters, Sandy is sitting over the warmest waters of the Atlantic, and those waters are deep. Although Sandy decided to sit in the same spot for more than a day, the warmth that drives the cyclone’s heat engine is deep enough that it does not all go to the surface to be used. Secondly, shear atop the system is relatively low, and in this case seems to be ventilating storms to the northeastward. The main inhibition to strengthening in the first day or so will be Jamaica and then Cuba. After landfall, shear will be on the increase, which will slow intensification and may actually cause Sandy to weaken in the Atlantic east of Florida. Sandy should be a hurricane as it reaches Jamaica and Cuba tomorrow. The main steering mechanism will be a largely amplified upper level pattern, which has wedged a high pressure system into the southeastern US. The initial NNE movement is due to a large trough in the central Atlantic. Tomorrow that movement will be guided by the high pressure system as it pushes to the east-southeast ahead of the large cold front currently in the northwestern US. At that point clock-wise rotating air around the high pressure on the southwestern side and upper level winds will take over to bring Sandy NNE. From there on, the upper level trough the is moving across the northern tier of the country will guide Sandy up the coast, but we’ll talk about that in the days to come. Rainfall will be a big impact especially in the mountains of Jamaica, eastern Cuba, and Haiti. Surge will have minor impacts on the southward and southeastward facing beaches of Jamaica and Cuba. In the coming days, we’ll talk more about Florida impacts, the Bahamas, Bermuda, and the northeastern US. Posted on Tuesday, October 23rd, 2012, in Florida Weather, Tropical Weather. Bookmark the permalink. Leave a comment.